It is easy to conceptualize the ocean as infinite. It is unquestionably vast, deep, powerful, mysterious. Since before the Polynesian navigators set out in double-hulled outrigger sailing canoes to settle new archipelagoes, and Jules Verne imagined secret cities and worlds 20,000 leagues down, the unfathomable size of the world’s oceans have reminded humanity of how tiny and insignificant we are. The living ocean is in real danger. Surfers now get infected from contaminated water at some of the world’s classic breaks, such as First Point Malibu. Older generations of fishermen and divers tell us of the limitless bounty of fish and seafood of their era, telling us of catches so big and abalone so abundant that we would laugh them off as “fish stories” if it weren’t for the photos. Scientists tell us that sharks and some other fish are at 10% of their previous population. How are we impacting the vast oceans? In the 1967 film “The Graduate”, a well-meaning friend of his parents tells young Benjamin Braddock (played by Dustin Hoffman) that “there is a future in plastics…” and he was not wrong. In the last fifty years, plastics have been instrumental in developing technological advances from the fighter jet to the ipod. But single-use plastics—which are built to be practically indestructible— have had a devastating effect on our oceans. They inevitably find their way into the ocean, where they break into tiny pieces and become floating detritus, harming birds and fish and other creatures that mistakenly ingest these foreign substances, but cannot digest them. Plastic pollution has now been carried by the currents to contaminate the most remote and pristine ecosystems in the world. Earlier this month, my hometown Los Angeles became the largest city in the US to ban single-use plastic shopping bags. This is a huge step towards reducing plastic waste in the oceans, and other cities will follow. We all make choices every single day about when and how to use and dispose of plastics, and we should always consider ocean health when we do. Ocean oil spills such as the 1989 Exxon Valdez incident and 2010 Macondo blowout in the Gulf of Mexico attract a lot of attention as tragic accidents with disastrous consequences, and they are. They are impossible to clean up and follow-up studies are showing that the effect on the ecosystem will be wide-ranging and long-lasting. Oil drilling is destructive to the oceans even when there is no catastrophic spill. Seismic exploration for oil wells can kill and injure marine mammals, and carbon pollution from the use of oil contributes to acidification. Right now, Shell is trying to obtain a permit for drilling in the Arctic, and there are ongoing battles against drilling in the Gulf of Mexico and off the Atlantic Coast as well. It is essential that we let our political leaders know that we will not tolerate this risk. It is common knowledge that emissions from fossil fuels contribute to climate change and sea-level rise, but much less talked-about is the fact that elevated carbon in the atmosphere actually affects the chemical composition of the ocean water itself? Corals and shellfish are most directly affected by acidification, which prevents them from creating their calcium exoskeletons and rippling effects throughout the ecosystem. To counter ocean acidification, we need to drastically cut the amount of fossil fuel emissions worldwide by transitioning to cleaner energy sources. The first step is to end government subsidies for the coal and oil industries. Last week, the top 20 economic powers in the world met in Rio de Janeiro in Brazil for an “earth summit” to assess the state of the world environment. Ocean protection was one major topic of discussion and it looks like a lot was accomplished. International conventions and binding agreements are important structures, but the most impactful things we can do are often simple everyday actions. Substitute a car trip for a bike ride, say no thanks to a plastic bag at the store, or pick up three pieces of trash when you pack up your next blissful day at the beach. Labels: Earth Summit, Plastic Pollution, What Can You Do? Water Brothers Tyler and Alex tell about their journey on a 5 Gyres Research Expedition into the North Pacific Gyre for season II of their documentary series. The remote area is commonly known as the horse latitudes and the onboard team gathered samples there over several days to test for the level of concentration of plastic debris in the ocean accumulation zone. The Royal Ontario Museum's Dave Ireland is also interviewed and explains the impact of the ocean plastic problem on the marine life food chain and how our ingesting of sea food-infused microscopic plastics, can lead to serious health effects in humans. Midway Atoll is a 2.4-square-mile atoll in the middle of the Pacific Ocean with three islands covering 1,549 acres. It's small, remote, and an essential landing strip for giant seabirds. More than three million of them plop down on the islands every year, which means it's crowded, especially when the birds decide to lay their eggs. Virtually every square foot has a nest. Three species of albatross, of which the most prominent is the Laysan albatross—with 450,000 nesting pairs, take up space on the island every winter. Laysans are big birds, with roughly six-foot wingspans. They stay, more or less, for nine months. They are monogamous, for the most part, and can live for up to 40 years. After the pairs land in October or November, they spend some time dancing and clicking and deciding on a nest before laying an egg. The male and female take turns incubating the egg for about two months, fly off on a series of epic journeys to find food for their young over the course of four or five months, and then leave the youngsters alone so they can fledge in June or July. Photographer and filmmaker Chris Jordan stepped into this scene—carefully, of course—and stayed for a couple weeks. It affected him in a profound way. That's because, as you've probably heard and seen, a lot of the chicks die with large amounts of plastic in their stomachs. Their parents inadvertently scoop up the debris while feeding on squid and other fish at the top of the Pacific Ocean, and regurgitate the plastic into the youngsters' mouths. Eventually, Jordan decided to make a movie called Midway, and he wants to go back. He's hoping to raise $100,000 on Kickstarter to finish his project. We checked in with him to find out a little bit more about his motivation. Do you have a favorite photograph of an albatross chick?The two weeks we spent photographing the hatching chicks on Midway was one of the most beautiful experiences of my whole life. The mother albatrosses allowed us so close to their hatching babies that in one case, my lens was right in the nest and the mother’s wing was resting on my head. Albatrosses are as big as eagles, with powerful beaks that could rip your face off if they decided to. But they trusted us to come literally within a few inches of their hatching babies with our cameras, displaying an elegance and grace that was incredible to behold. I will never forget the intimacy of that experience. Was there a specific moment when you decided to make the film? The moment I knew I had to push deeper into the story of Midway was when I was visiting a girls’ school in Brisbane, Australia, showing my photographs of the plastic-filled birds. At the end of my talk, one of the teachers broke down weeping in front of her whole school. I stood there frozen, with my heart breaking, as tears poured down her face and her voice shook with horror and grief, and she asked me “How do we get to hope from here?” Her question resonated for me like a temple bell on so many levels, and I didn’t have an answer. I think maybe that’s a question we are all holding right now, as the news about the health of our world gets worse every day, and our leaders become more and more lost and paralyzed. I knew I had to go back to Midway and stand in the fire of that question until I had something to offer that teacher. The result has been a three-year project that has changed my life at the very core. What have scientists told you about what the plastic does to the Albatross chicks? That is complex because albatross chicks have a high natural mortality rate, and it is difficult to determine in a particular case whether a chick died from plastic or from other causes. For example, if two parent albatrosses leave their nest for five days in search of food, their chick may be subjected to dehydrating heat, or rain storms that cause hypothermia. If the baby dies during that time, who can say what was the exact cause of death, and whether the 22 plastic bottle caps in its stomach had a contributing effect? All that can be said with certainty is that the plastic is increasing the mortality of the albatross chicks by an unknown factor. But personally, I am not so much interested in saving the albatross as I am in receiving the urgent alarm signal they are sending us about the state of our world. The birds on Midway are like messengers, the canary in the coal mine. When the canary dies, the miners don’t run over and try to save the canary— they receive the message that bird just gave its life delivering, and then act quickly to save themselves. That approach resonates with me because it doesn’t view the birds as helpless victims that we passively observe; it places a duty on us to receive their message, and be changed by it (or not). What do you hope the end result of the movie will be? I believe the story of Midway Island offers a profound metaphor for our time, like an epic piece of literature that carries symbolism and archetype on multiple levels. A lot of smart people are saying that what humanity needs right now is a shift in our story, and my own theory is that we need a new love story—a real one that we can believe in, and that includes us all. First-world culture has lost its connection with a deeply felt reverence for the miracle of our life, and for our sacred place in the great mystery. Being on Pihemanu (the Hawaiian name for Midway) is like standing on a razor’s edge between darkness and light, paradise and hell, the past and the future; it is a focused microcosm of our world, where horror meets innocence, grief meets joy, birth meets death, all wrapped in an envelope of violent history and stunning natural beauty that overwhelms the senses and transforms the mind. I don’t hold any specific hopes for the end result of my project; my fiduciary duty runs to the story itself, and I consider it my job to honor that story with the highest quality piece of visual poetry that can be achieved with the resources I have available to me. And once I tell that story, my role is done, and that is where the viewer’s responsibility begins. For more on the Midway Film Project by Chris Jordan, check out Kickstarter. An artificial reef created in 1972 off the coast of South Florida has turned into a costly cleanup project. FORT LAUDERDALE, Fla., Feb. 17 (AP) — A mile offshore from this city’s high-rise condominiums and spring-break bars lie as many as two million old tires, strewn across the ocean floor, a monument to good intentions gone awry. Little sea life has formed on the tires. Some tires that were bundled together with nylon and steel have broken loose and are scouring the ocean floor across a swath the size of 31 football fields. Tires are washing up on beaches. Thousands have wedged up against a nearby natural reef, blocking coral growth and devastating marine life. Similar problems have been reported at tire reefs worldwide. “They’re a constantly killing coral-destruction machine,” said William Nuckols, coordinator for Coastal America, a federal group involved in organizing a cleanup effort that includes Broward County biologists, state scientists and Army and Navy salvage divers. Gov. Charlie Crist’s budget includes $2 million to help remove the tires. The military divers would work at no cost to the state by making it part of their training. A monthlong pilot project is set for June. The full-scale salvage operation is expected to run through 2010 at a cost to the state of about $3.4 million. Mr. McAllister helped put together the ill-fated reef project with the approval of the Army Corps of Engineers. He helped raise several thousand dollars (the county also chipped in), organized hundreds of volunteers with boats and barges, and got tires from Goodyear. Goodyear also donated equipment to bind and compress the tires, and the Goodyear blimp dropped a gold-painted tire into the ocean in a ceremonial start to the project. It was a disappointment, like other tire reefs created around the world in recent decades. No one can say with certainty why the idea does not work, but one problem is that unlike large ships that have been sunk for reefs, tires are too light. They can be swept away by the tides and powerful storms before marine life has a chance to attach. Some scientists also believe the rubber leaches toxins. Virginia tried it several decades ago. But Hurricane Bonnie in 1998 ripped the tires loose, and they washed up in North Carolina. 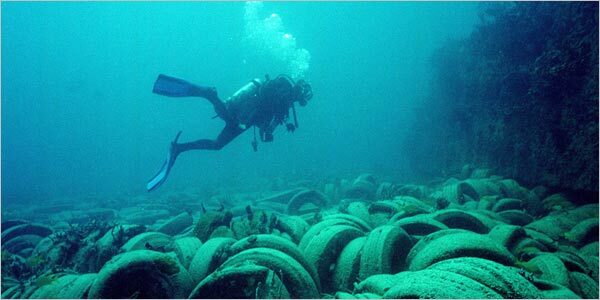 Most states have stopped using tires to create reefs, but they continue to wash up worldwide. In 2005, volunteers for the Ocean Conservancy’s annual international coastal cleanup removed more than 11,000 tires. Tires retrieved from the waters off Fort Lauderdale will be ground up for use in road projects and burned for fuel, among other uses. As of May 23rd 2012, Los Angeles became the largest city in the United States to put a ban on plastic grocery bags. Over the next 16 months the city will be phasing out single-use bags in favor of reusable ones. Los Angeles joins the ranks of forty-seven other California cities that have also endorsed the ban. Environmentalists and plastic bag ban advocates are hopeful that this will prompt other large cities to quickly follow suit. So how many plastic bags do we actually use? A common estimate for the number of plastic bags consumed each year is 500 billion, although many environmentalist organizations claim that the number is closer to 1 trillion. These estimates would require 60 to 100 million barrels of oil per year to produce. According to the Wall Street Journal, the United States goes through roughly 100 billion plastic grocery bags every year. China, with its vast population has, in the past, been the largest consumer of plastic bags. According to China Trade News, China consumed up to 3 billion single-use plastic bags a day, before the country took steps to ban production and free retailer use before the 2008 Olympics. While major Chinese supermarkets report that they have greatly reduced their consumption of the bags, the ban has not been nearly as successful as many had hoped with plastic bags still in wide use throughout the country. What happens to single-use plastic bags after they are discarded? Many of the plastic bags used end up in the ocean, as the second most common ocean refuse after cigarette butts. It has been estimated that every square mile of ocean has approximately 46,000 pieces of plastic floating in it. According to the United Nations, 10% of the plastic produced every year worldwide will end up in the ocean. The Great Pacific Garbage Patch is a prime example of what happens to plastic when it enters the ocean. A subtropical gyre, creating a slow moving clockwise spiral of ocean currents, it is filled with millions of pounds of trash, the vast majority of which is plastic. Scientists estimate that its size is about twice that of the state of Texas, and is ever increasing. While the plastic in this huge oceanic dump will not degrade any time soon, it continues to break down into smaller and smaller pieces creating a murky wasteland of plastic. Once in the ocean or landfills a plastic bag will take 400 to 1,000 years to degrade, and no more than 5% of the bags are ever recycled. Besides ending up in the ocean or being buried in local landfills, a significant amount of the world’s plastic waste is shipped to China. As the largest waste importer in the world, China brings in enormous amounts of paper, plastic, and electronic waste each year. The UK has reported exporting over 200,000 tons of plastic waste to China each year. With landfill costs up, it is cheaper to send waste abroad than to dispose of it domestically. The Chinese waste industry has experienced an economic slump in recent years leaving countries like the U.S. and UK with the burden of disposing plastic waste within their borders. The plastic bags we use on a day to day basis will never disappear in our lifetime, a fact that kind of makes you think twice before using them in the first place. With the world population ever growing the amount of non-biodegradable waste will increase as well. While banning plastic grocery bags seems a step in the right direction, will it really make a difference? According to the campaign’s website one million seabirds, 100,000 marine mammals and turtles die every year when they entangle themselves in or ingest plastic pollution. The Great Pacific Garbage Patch: What Is It and What Can You Do? Tons of plastic and other debris end up in our oceans every year. In fact, of the 200 billion pounds of plastic produced every year, about 10% eventually makes its way to the ocean. It may start out as litter on the beach or as rubbish tossed from the side of a ship, but no matter where it comes from, this trash will eventually get picked up and carried by ocean currents. These currents, known as gyres, work like a vortex to concentrate all that floating garbage in a central location. In the north Pacific Ocean, this oceanic dumping ground is known as the Great Pacific Garbage Patch, and it’s situated about halfway between Japan and the west coast of North America. Estimates of its size range from the area of Hawaii to the span the of continental U.S., but because the debris patch can drift by thousands of miles depending on currents and weather, it’s exact scope has been difficult to determine. Similar patches have been found in other parts of the Pacific and in the Northern Atlantic as well. So what’s floating out there? While most of us probably think of a giant floating landfill when we hear about ocean litter, in fact most of the debris in the Great Pacific Garbage Patch isn’t actually visible to the naked eye. Instead, the majority of the waste is made up of tiny particles of plastic suspended at or below the surface of the water. Unlike biological waste, which decomposes into elements like hydrogen, oxygen, and carbon that can be reused in the environment, plastic never breaks down. Instead, when a plastic bag or bottle ends up in the ocean, it will be physically broken into smaller and smaller pieces, but those pieces never stop being plastic. Sampling has shown the concentration of these bits of plastic to be extremely high in the Great Pacific Garbage Patch, but because the pieces can’t easily be seen it is difficult to judge just how widespread the pollution is. All sorts of other waste also gets caught up in ocean currents and deposited in the Pacific Garbage Patch, but because plastic floats and is so abundant it makes up the vast majority of ocean debris. All this trash poses a number of serious environmental hazards. Large debris like nets and bags can drown or strangle animals like birds and turtles, while small underwater particles damage or kill the birds, fish, and filter feeders that mistake them for food. Tiny plastic particles are also known to absorb pollutants from the water, which means that when they’re eaten these chemicals either poison the animal or are carried further up the food chain. Finally, many of the toxic chemicals used to produce plastics, like phthalates, BPA, and dioxins, can leach from floating plastic trash into the water. These little plastic particles are nearly impossible to clean up, which is why avoiding plastic in the first place is always one of the best things you can do to help the environment. When possible, opt for more eco-friendly materials like glass, metal, or ceramic instead. For example, you can replace plastic storage containers with glass, plastic shopping bags with cloth ones, and disposable razors, pens, and bottles with reusable options. And to help keep the plastic you do use out of the oceans (and out of landfills), make you always recycle and support eco-friendly companies by buying recycled products. Labels: The Great Pacific Garbage Patch, What Can You Do? 1 – First step is to get yourself educated. Learn about all the different items that can be recycled and find out how and where you can recycle them. 2 – Set up a designated recycling bin in your home. You and your family will be more likely to recycle items if you have a bin for recyclables. Even the kids will quickly learn what to recycle. 3 – When you are out and about, be sure your trash and recyclables make it into the proper bins so that none of them end up on the ground, in the local lake or river, on the beach, in the ocean or anywhere else in nature. 4 – Invest in a reusable water bottle. Why waste money on a plastic water bottle when you can buy a reusable water bottle that you can fill up anytime you need it. They are easy to take with you and will save a lot of time, money and plastic waste. 5 – Cut down on “single use” items. No more plastic utensils, paper plates, straws, plastic bags, and other items. A prime example is the single wrapped food item, such as cheese slices. You’ll save a lot of plastic when you buy a block of cheese and slice it yourself. 6 – When you go out to the park, on a picnic, hiking or any other outdoor activity, be sure to follow the “leave no trace” motto and pick up after yourself. By packing your own reusable containers you will have less waste and it will be less work all around. 7 – Participate in or organize an aquatic clean up event at your local beach, lake, or waterfront. This is a great way to get involved, with the community, to help keep the oceans and water clean. You should also rally to get permanent recycling containers set up (if they don’t already exist). or those of you who want to take extra steps towards helping protect our oceans, you can download the Monterey Bay Aquarium’s Seafood Watch app so you know which restaurants serve ocean-friendly seafood and sushi. Then make the seven C’s pledge for ocean conservation. Commit to making a real difference, conserve in your own home, be a conscious consumer, communicate your concerns and interests, challenge yourself on a daily basis, connect with your local community and celebrate the oceans! Last but not least, wear blue this Friday to show your support for World Oceans Day and at your earliest convenience, visit the ocean (or your local lake) to help remind yourself why you recycle and take the steps you take to help protect the oceans and Earth itself. We Need Your Bottles... All 23 Billion of Them! The UK is sitting on top of 1.4 million tonnes of untapped resource in the form of post consumer plastic that could drive the UK recycling industry to the next level. That’s according to pioneering plastic bottle recycler, Closed Loop Recycling which is launching a brand new campaign, backed by the Mayor of London, Boris Johnson in support of the British recycling industry, aimed at encouraging all aspects of the supply loop to collect and recycle more plastic bottles here in the UK. 1.8 million tonnes of post-consumer plastics are generated every year in the UK, nearly a third (580,000 tonnes) being plastic bottles – that’s 23.2 billion bottles. However 300,000 tonnes of good quality plastic is still sent to landfill each year and a large percentage of what is collected - 70 per cent in the case of bottles - is shipped abroad, stifling the UK recycling industry which relies upon this valuable resource. Unveiling a specially designed logo, Closed Loop Recycling is launching its campaign with a hard-hitting ‘We Need Your Bottles’ message to coincide with National Recycle Week (18-24 June 2012), which is focusing specifically on plastic bottle recycling. At a time when there is a huge national focus on all things ‘British’ thanks to last weekend’s Diamond Jubilee celebrations and the upcoming London 2012 Olympics, Closed Loop Recycling is urging the British public to remember to place their used plastic bottles in available recycling bins – whether at home or out in public places – in order that they can be collected for recycling into new food and drink packaging. An example of this is in the London borough of Westminster, which was at the heart of nationwide Diamond Jubilee celebrations last week, Closed Loop Recycling took receipt of all plastic bottles that were collected by waste company Veolia from streets and recycling bins, carefully sorting, washing and super-cleaning them into material for companies such as Marks & Spencer, Britvic and Solo Cup. Plus throughout the busy Olympics period Closed Loop Recycling will be receiving plastic bottles collected on the London Tube network thanks to its contract with Bywaters. Closed Loop Recycling CEO Chris Dow explains: “’We Need Your Bottles’ is all about educating people about the importance of mining Britain’s urban forest. Used plastic bottles are a valuable resource to the UK recycling industry, which has the knowledge and technology to recycle them for the future. “By encouraging consumers to recycle more than they are doing already, asking waste firms to support UK recyclers rather than shipping overseas and incentivising UK brands to use UK-sourced recyclate in their packaging, companies like ours will be able to grow further, create more green jobs and boost Britain’s low carbon economy. As part of its campaign, Closed Loop Recycling is urging the government to review the current PRN/PERN system so that it no longer favours overseas waste shipments versus domestic recycling. The company is asking for a more level playing field. "My name is Abby Goldberg, and as a 12-year-old girl who, after seeing the devastation that millions of plastic bags have caused the environment and ocean life, I made my school project this year to be getting a local ban on single-use plastic shopping bags in my home town Grayslake, IL. Now it’s in the hands of our Governor to stop them, but he needs to hear from all of us! I am not scared – even though I’m just a kid, I care too much about animals, our environment, and our future natural resources to let them beat down my town, just so they can make an extra buck. Now I need your help to stop them, and give hope to other people around the world that they can stand up for their own rights! The governor could sign at any minute, so we need your voice as soon as possible, or my dream of getting a healthier environment for my town, our environment and our world will be totally crushed. I urge you not to let and plastic-industry corporations use government to eliminate the right of citizens to determine their own local policies. I stand with 12-year-old Illinois resident Abby Goldberg in asking you to veto a dangerous bill before you that would prevent communities across the entire state of Illinois from taking action to care for their local environments. The so-called "Plastic Bag and Film Recycling Act," while noble in name, is actually a plastic-bag-lobby bill designed to strip communities of the right to find alternatives to single-use plastic bags. Abby is working hard in her community to try and pass a plastic bag ban -- a measure we know is extremely effective in curbing the pollution caused by rampant plastic bag use. Plastic bags litter our farm lands, hang from our trees, choke up our waterways, hurt our wildlife, and their production wastes oil and natural gas that we need to help us bridge to a renewable-energy economy. That's why communities all around the country -- from Seattle to Austin to Los Angeles, and even the entire state of Hawaii – have successfully banned the distribution of plastic bags. But the legislation before you would rob Illinois communities of the right to do the same, including Grayslake, Illinois, Abby's hometown, where she's worked extremely hard to get a local bag-ban. Don't allow Illinois to undo the work of Abby and concerned citizens around the country, who want to take care of and preserve their environment. Please veto the "Plastic Bag and Film Recycling Act," IL SB3442. As Abby Goldberg says, this bill is a wolf in sheep's clothing, and will only serve to harm communities across the state. 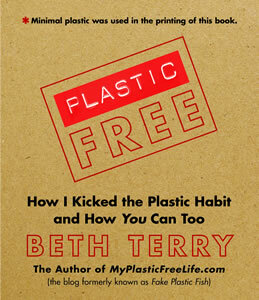 The Book For Plastic Addicts and Their Friends! Updates: As I mention in the Author’s Note, while the principles of plastic-free living are timeless, the specifics can change. Resources change, websites move, companies go out of business, campaigns succeed or fail. Visit the Updates Page for changes and corrections since the book went to press in early 2012. Order the book from BuyGreen.com. Your book is guaranteed to arrive in plastic-free packaging, and a higher percentage of your dollars will support MyPlasticFreeLife.com. Order the book (or download Kindle version) from Amazon.com. Order the book (or download NOOK version) from Barnes & Noble. Order the book locally through IndieBound. Order a signed copy directly from me at full cover price of $19.95 plus sales tax and shipping. $2.00 will be donated to the Plastic Pollution Coalition. Only one book per order address. Please pay via PayPal or contact me directly for other payment options or if you are outside the continental United States. If you would like me to write anything special in the book (the name of the recipient or a particular message), please let me know in PayPal’s “Special Instructions to the Seller” section under your shipping address. Click the button below to order a copy to be sent via Media Mail within the continental United States. Labels: My Plastic Free Life by Beth Terry, What Can You Do? Councilman Paul Koretz has proposed banning plastic and paper bags. But lobbyists for the bag industry are pitching a weaker alternative at City Hall. A lobbyist representing a consortium of plastic bag producers was roaming the halls of Los Angeles City Hall this week, trying to torpedo Wednesday's anticipated City Council vote to ban the ubiquitous, flimsy flower that litters the urban landscape and fouls the seashore. Naturally, environmentalists were in a tizzy, fearing the worst outcome while hoping for the best. Under the proposal by Councilman Paul Koretz, paper bags would also be banned, and Los Angeles would become a national leader in the proliferation of reusable bags. The worry among enviros was that a weaker and more voluntary alternative proposal, drafted by the bag industry and offering retailers a chance to buy out of the restrictions by paying a fee to the city, might be introduced if a sponsor could be found. They're also nervous about rumors that former Assembly Speaker Fabian Nuñez himself was in the hall on behalf of the bag people. Nuñez is unloved by green-folk for helping to scuttle a statewide bag ban two years ago. But I couldn't find anyone who'd actually seen Nuñez. Was he lobbying in broom closets? I suggested to one council member that there was an easy way to flush him out. Announce a high-end wine tasting in the rotunda, with a junket to study bag disposal in and around four-star European hotels. Nuñez — famous for his champagne tastes while globe-trotting on the state dime — would be first in line. But when I called Nuñez's office, a colleague returned the call to say Nuñez was not lobbying in L.A. He was in Sacramento, "providing strategic counsel" on the bag issue. And who are the clients? "A consortium of plastic bag manufacturers." This person said I needed to talk to Vanessa Rodriguez, who was doing the actual City Hall lobbying for Mercury Public Affairs. But Rodriguez called me from City Hall and said I needed instead to talk to Donna Dempsey of the American Progressive Bag Alliance, who was also making the rounds in City Hall. I was waiting for the promised call from Dempsey when someone called from Hilex Poly, a plastic bag manufacturer and recycler in South Carolina, saying that no, Dempsey would not be speaking to me. They were trying to get hold of someone else who could answer my questions. If I might offer a bit of strategic counsel — for far less than whatever Nuñez is charging — it isn't good PR to act like you're trying to hide something. In the end, Mark Daniels of Hilex Poly called to answer my questions. He's chair of the American Progressive Bag Alliance — are there regressive bag alliances? — and he thinks the L.A. bag ban introduced by Councilman Koretz is "just a terrible idea," and he threw in "outrageous" for good measure. Banning plastic and paper bags will cost "a tremendous amount" of sack manufacturing jobs held mostly by Latinos in California, and export them to China, Daniels claims. He also said plastic bags can be and are recycled in great numbers, and charging a buck or two for reusable bags is a hardship for many families. He said the Koretz plan to have stores temporarily charge 10 cents for paper bags until an eventual ban is regressive, and he argued that proponents are over-estimating the amount of bag litter, underestimating the amount of recycling, and exaggerating the amount of damage to marine life caused by bags. "You think 3 million people are going to clean their reusable bags after every use?" asked Daniels, who claimed that plastic bags account for such a tiny fraction of litter, banning them "will have zero environmental impact." He was beginning to sound like a man whose main interest is selling bags. By some estimates, the amount of plastic bags in California's waste stream is in the thousands of tons, many of them are not biodegradable, and the cost of disposal is in the many millions. I once slogged through Compton Creek with Heal the Bay, before L.A. County supervisors beat the L.A. City Council to the punch and banned plastic bags and reported a 94% reduction in the use of plastic bags, and they were wrapped around plants and layered into the banks like lasagna. Everyone has seen them draped against fences, dancing down streets and clogging storm drains. A 2010 survey by Ocean Conservancy's International Coastal Cleanup found that plastic bags were second on the floating litter list behind cigarette butts and ahead of food wrappers, caps, lids, cans and bottles. Paper bags rounded out the top 10. Koretz said only a small fraction of plastic bags manufactured in California end up in Los Angeles, so claims of big local job losses are nonsense. He said there's a local program in which veterans are producing reusable bags, and he thinks more green jobs would be created with a plastic ban. Councilman Tom LaBonge, for one, favors the ban on plastic bags, which he says are a particular eyesore along the Los Angeles River. LaBonge said he wonders why the city doesn't attempt to collect fines for littering as aggressively as it goes after parking and traffic infractions. But he's not sure about the ban on paper bags. He wants an updated study on where trash comes from and where it ends up. I'm hearing that other council members may have the same reservations about banning paper. Koretz's plan calls for a six-month education period, followed by a ban on plastic and an 18-month period in which paper bags cost 10 cents before being banned altogether. He told me he's thinking about a revision in which the total ban on paper would be put to a vote at the end of the 18-month trial. On a personal note, I have several reusable bags, but often leave them in my trunk at the grocery store and get paper bags, which I use to recycle newspapers at my house. If the store begins charging me 10 cents apiece, I'll stop getting paper bags. No Hollywood ending for plastic bags in L.A.